So you wanna start the New Year eating better? Fresher, lighter, wholesome gluten-free foods that help you feel rejuvenated rather than weighed down? Join me for a quick morning spa retreat! Quaker Oats recently invited me to develop an original recipe using their new gluten-free oats. It’s light and hydrating, just enough to get your morning going in the right direction. Steamy goodness with a minty kick, the perfect breakfast for a cold winter morning. While browsing the recipe booklet that came with my new Japanese rice cooker a few years back, I discovered a recipe for green tea rice porridge (genmai chagayu). The savory side of this dish (lentils and seaweed) didn’t appeal to me, but the concept of using tea to make breakfast intrigued me. Evidently, there are several different versions of this traditional savory green tea porridge, and they are used for cleansing after new year feasting and/or for when you feel a little worn down or sick. Then I started to think about the endless possibilities using other teas too. Now I’m happy to introduce you to my new favorite breakfast!! 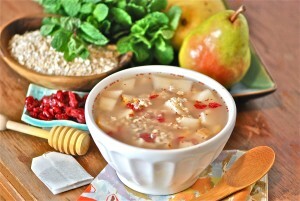 Hydrating mint tea compliments seasonal winter pears, and dried cranberries add a little chewy tangy twist here and there. Wholesome oats add some starchy substance. Lightly sweetened with honey this combination is a fresh and simple way to start your day. Bring hot water to boil. About two cups. Place 1/3 cup Quaker Gluten-Free Oats in cereal bowl. Add 1/2 chopped Bartlett pear and 3 Tbsp dried cranberries. Cut open mint tea bag and sprinkle entire contents over bowl. Drizzle honey to taste and mix contents. Pretend you’re at a luxury spa on vacation and savor! As always, let me know what you think in the comments below!!! And want more recipe ideas? Download this Quaker Gluten-Free Oat Recipe Booklet. Post an oatmeal related comment below and be sure to include your email address. I’ll pick a winner and announce it on the blog Thursday January 28th, 2016. Entries closed as of 12am Thursday January 28th, 2016.
administered by Quaker or its affiliates, but solely by Celiac Chicks. KNOW SOMEONE GLUTEN -FREE WHO MIGHT LIKE TO ENTER OR TRY THIS NEW RECIPE? I have used decaf Chai Tea and sometimes others in my oatmeal.Mint is one of my favorite things so I’ll have to try this option too. I’ve also replaced the water for oatmeal with almond or soy milk and add chia and flax to kick up the protein a bit. I adore oatmeal! I like it sweet and savory, in the microwave/stove/crockpot, and with and without fruit. I want it all of the ways!! Hey – who won – it was supposed to be posted on Jan 19? Recently diagnosed with celiac and thrilled to find out there’s a gluten-free oatmeal. It’s my favorite breakfast. 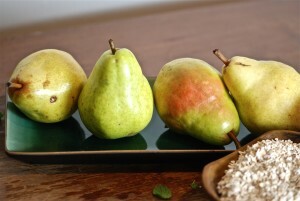 Love the idea of pears in the gf oatmeal! Will be buying the ingredients for you recipe soon. Nothing better than a warm oatmeal cookie! Can’t wait to try these out! Nothing better than warm cinnamon oatmeal before braving the cold air in the morning! 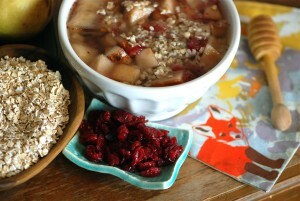 winter mornings + oatmeal = perfect breakfast! I recently began eating oatmeal. I like it with milk and I find I can sneak some calcium in. Hmmm maybe not the mint. Just sounds odd. everything else sounds good in this recipe. Oh that recipe looks so amazing! 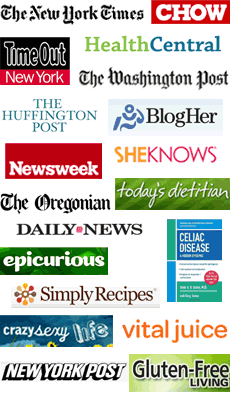 I was diagnosed with celiac disease about 10 years ago now. 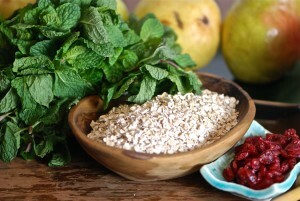 Oatmeal is one of my favorites…and cannot wait to try your recipe. So neat using the tea bag!